What is an Enrichment Cluster? Enrichment clusters allow students and facilitators who share a common interest to come together for a specified time each. 1 What is an Enrichment Cluster? 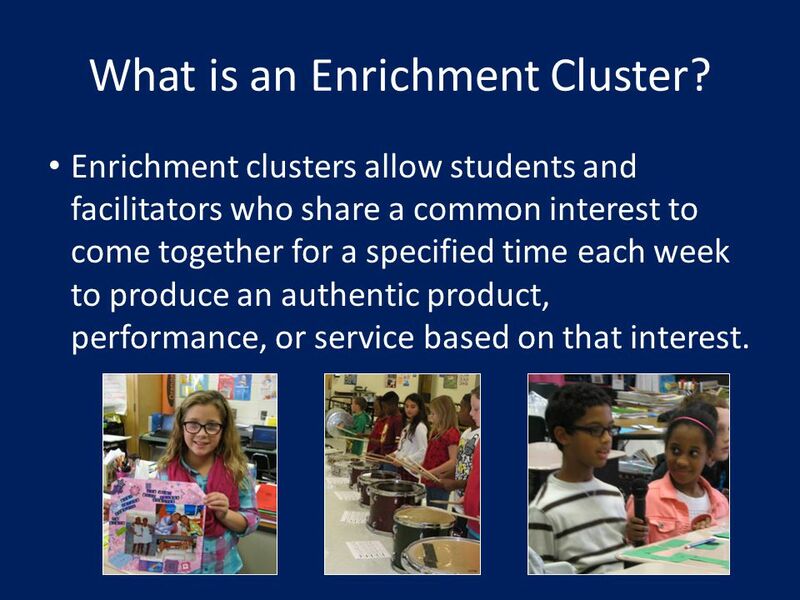 Enrichment clusters allow students and facilitators who share a common interest to come together for a specified time each week to produce an authentic product, performance, or service based on that interest. 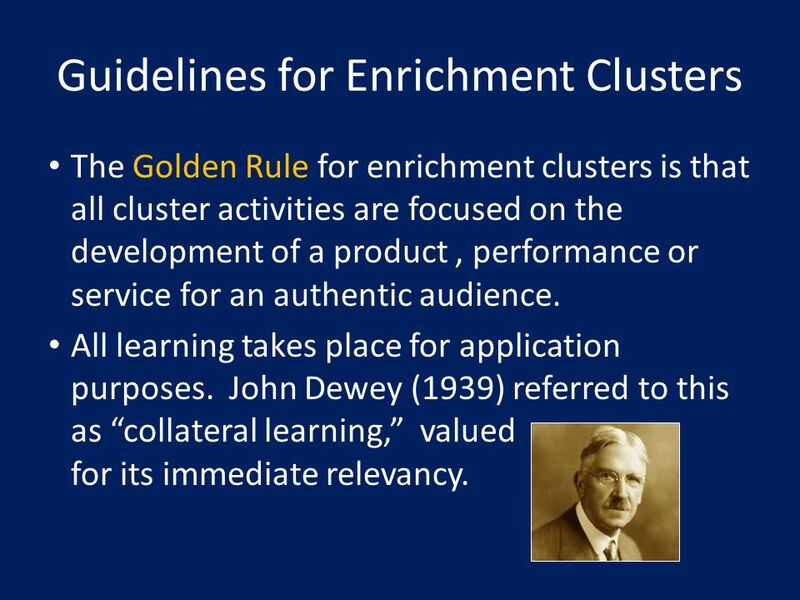 2 Guidelines for Enrichment Clusters The Golden Rule for enrichment clusters is that all cluster activities are focused on the development of a product, performance or service for an authentic audience. All learning takes place for application purposes. John Dewey (1939) referred to this as “collateral learning,” valued for its immediate relevancy. 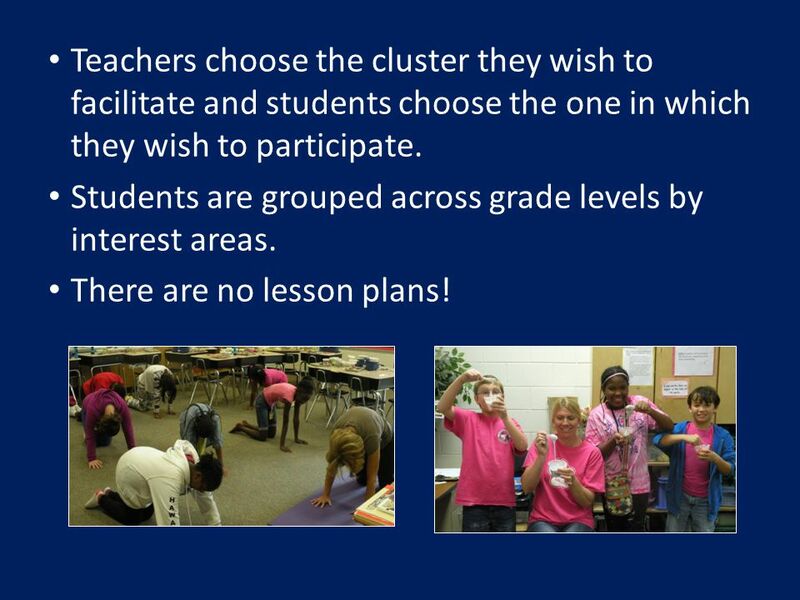 3 Teachers choose the cluster they wish to facilitate and students choose the one in which they wish to participate. Students are grouped across grade levels by interest areas. There are no lesson plans! 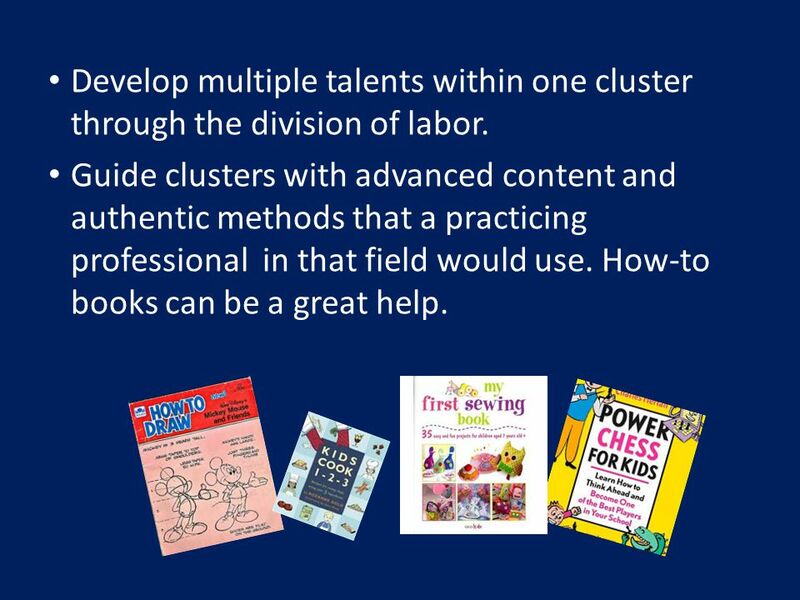 4 Develop multiple talents within one cluster through the division of labor. Guide clusters with advanced content and authentic methods that a practicing professional in that field would use. How-to books can be a great help. 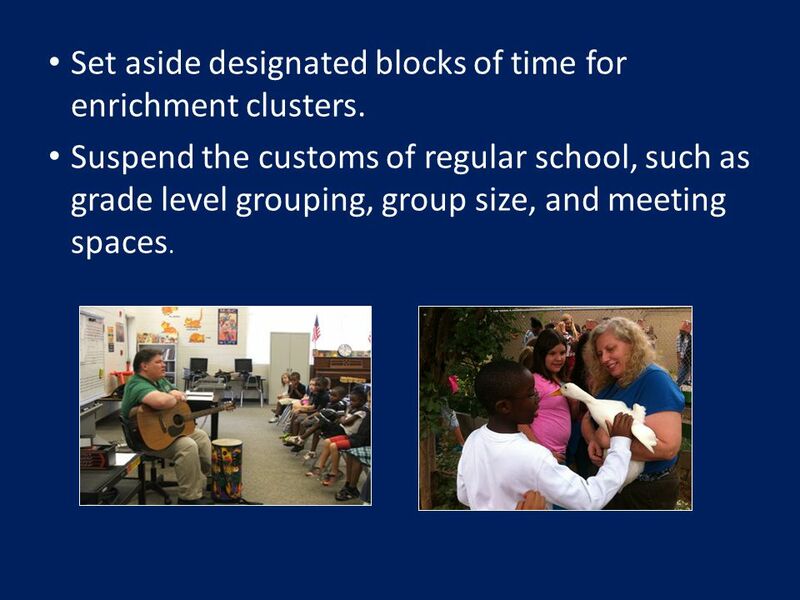 5 Set aside designated blocks of time for enrichment clusters. Suspend the customs of regular school, such as grade level grouping, group size, and meeting spaces. 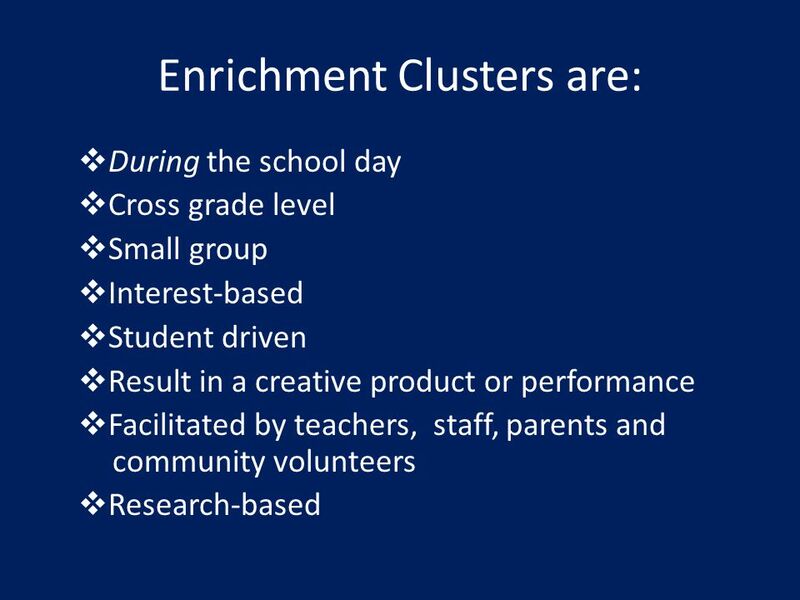 Download ppt "What is an Enrichment Cluster? Enrichment clusters allow students and facilitators who share a common interest to come together for a specified time each." Village Extended School Program Monrovia Unified School District Cohort 1 ASES Program Since 1999 Awarded the Golden Bell for Program Excellence. Cambrian Union School District GATE Update January 2011. Welcome!. Agenda ThinkStretch Summer Learning Program overview Why is summer learning important? Summer Learning Program details. Informational Meeting February 3, Agenda Welcome and Introductions GLEEM Overview Preview of Modules GLEEM Timeline and Implementation Design Application. Haw Creek Elementary Victoria Ferguson AIG Open House Meeting. Professional Development: Components for Technology Integration  Vision  Planning  Technology Skills Training  Evaluation & Assessment. National Science Standards  Teachers of science plan an inquiry-based science program for their students. Moyock Middle School School Improvement Plan Results and Next Steps. An Overview of GIFTED SERVICES Katy Cruise Resource Teacher for the Gifted. FOR YOUTH DEVELOPMENT FOR HEALTHY LIVING FOR SOCIAL RESPONSIBILITY PUTTING SUCCESS INTO WORDS Y Readers Charlotte, NC | Y READERS | ©2012 YMCA OF GREATER. CO-CURRICULAR & EXTRACURRICULAR ACTIVITIES. CCAs and ECAs are activities that education organizations create for school students. They serve to promote. Information Sharing Evening September 10, 2014 GIFTED AND TALENTED PROGRAM AT HARPER’S CHOICE MIDDLE SCHOOL Ms. Kelly Collins-McCarthy Gifted and Talented. EdPower Leadership Training, Time Management with Priority Setting. MSMC Collaborative for Equity in Literacy Learning K-6Programs at the Newburgh Armory Unity Center. Talent Development Middle School Program Comprehensive and customized approach for middle grades’ reform that effectively develops the talents of their. Lena Arena ICT Consultant, Sydney Region Creating Collaborative Blogs and Wikis.